While we are happily married with two beautiful children, I wouldn't say marriage is easy or even parenting but we are both committed to our family and our love and that helps us through the trials and tribulations! My husband and I had a long distance relationship for 3 years during our courtship, however, I can't imagine what it would be like to have a spouse serving in the military overseas for an extended period. I'm sure it takes its toll for both partners. The Art of Marriage Ops is an outreach to help military families strengthen their marriages when they return home from service. 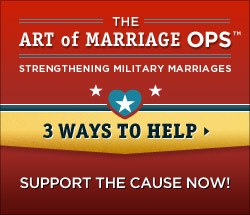 It equips military couples with The Art of Marriage DVD series. This proven program has shown to both strengthen marriages and prevent divorce by providing simple, effective insights for helping couples to cultivate a healthy and happy relationship. Check out the app below, you'll find out more regarding The Art of Marriage Ops and also find five date ideas! Share this with your friends too. 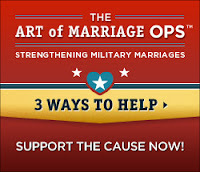 GIVE BACKIf you are interested in giving back consider donating by texting the word OPS to 80888 and donate $10.00 to help our men and women in the military strengthen their marriage by attending an event showcasing The Art of Marriage! Less than the price of two cups of coffee! (1) lucky reader will win a $20 Applebees Gift Card. Simply enter to win through the rafflecopter form below. Giveaway ends March 12th. Disclosure: A giveaway was provided to me in exchange for my honest review. The opinions and thoughts expressed are my own. I received no other compensation for my review nor was I under any obligation to give a positive review. I like going to dinner and a movie or bowling! oh I would love to win this! Thanks! date night, which doesnt happen very often, would be dinner and a movie or a concert! I'm entering on the rafflecopter with my Facebook username Mary Happymommy. I follow you in GFC under Mami2jcn and I subscribe with mami2jcn at gmail dot com. I like spending a date night at home watching a video. movie, cooking together and wine! we like to take dancing classes! thanks! I like to go out to a play at our local playhouse, or just stay home and cook dinner together. I love getting good food and playing video games or watching movies with my husband. Would love to go to dinner with my husband, with 3 kids we don't get out too often. We like to spend date night with a nice dinner, some shopping & quiet time together to reconnect & bond. We like to order in our favorite Chinese & watch a good new release DVD. I like to go to a dinner in a nice restaurant and see a show. The usual dinner and movie. But if we were zillionaires we would hop on over in a private plane to Paris France and do the town right! Our date nights usually include getting take out and coming home and snuggling watching a movie on tv. We usually have dinner out and then see a movie. I like to spend date night with my wife doing just about ANYTHING. Find a sleepover for our kids and just be US. The clickable link appears to be broken/mis-configured. Dinner and a movie is our go-to date. We usually go to a nice restaurant. I like to find an activity we both enjoy - even if it's sitting on the couch watching a movie. I would love to go dancing and have a romantic dinner! I love to spend date night curled up on the sofa, watching a good movie. Dinner and a movie sounds boring, but when I'm with my sweeties it's the most fun! we spend date night reading! Thanks for a super giveaway! Just a nice dinner and time alone would be a great date night for me! We don't get many date nights, normally only once or twice a year! But we end up going out to dinner and a movie :) It's just nice to get those little breaks when possible. I don't have a preference what we do. So long as I have QT with my hubby, I'm happy. I like a quiet dinner that I don't have to cook! I like going out to a nice dinner then coming home and cuddling in bed with a good movie! We like to spend date night with dinner and a movie ヅ *Thanks* for the giveaway! I haven't eaten out in so long I can't remember! Maybe last August or September. This would be a rea; treat! I like going to happy hour at a local sushi restaurant, and then heading home to curl up on the couch and catch up on DVR. I'm happy with a beer and a pool table! !